The temperature is dropping, leaves are turning and Buffalonians are finally taking out their flannel shirts and cozy scarves. Autumn ushers in a season of comfort food and big, knit sweaters, but this change in season doesn’t mean that it’s time to toss aside yummy, healthy foods that so many people opt for in warmer months. You really can have your pumpkin spice and eat it too. Green Eats Kitchen and Juice Bar in Orchard Park has fall flavors that would satisfy any fall foodie. Customers can pop in for a Pumpkin Oats brunch/ dessert jar with pumpkin spice, pure maple and vanilla or a sweet potato hemp seed quinoa bowl paired with warm, homemade soup. The juice bar also sells thick smoothies that are so delicious, you won’t believe that they’re actually good for you. Try a seasonal Hazelnut Maca Moca and add hemp seed for an extra energy boost or get the Good For You Banana Nut Muffin that tastes, well, like a liquid banana nut muffin. Each smoothie is so thick, in fact, that some customers drink them in place of a meal. “I would say that all of our smoothies could be used as a meal replacement because they are so heavy and thick,” explained Meaghan O’Shei, operating partner of Green Eats. The juice is less of a meal replacement and more of a delicious way to get the vitamins, minerals and all of that other good stuff that the little voice in the back of your head says you really should be getting more of. Just look at their green juices, just one bottle has the nutrient equivalent to eight salads. For those who haven’t quite acquired the earthy taste or are new to juicing, there are fruitier flavors. Different from what you might find in the grocery store, the juice that Green Eats sells is cold pressed in-house. Each bottle has a different health benefit. A jar of the Fountain of Blue, for example, can help with chronic pain. O’Shei recalled one slightly skeptical customer who visited the shop slightly hunched over and complaining of back pain. She sold him a bottle of Fountain of Blue, and the next day he walked in, back straight, and stocked up on several more bottles. While she doesn’t claim that the beverages are some sort of magical elixir, O’Shei has done years worth of research about which ingredients are healthiest for her recipes. Over time, O’Shei was able to switch out certain medications like Adderall for natural ingredients like hemp seed. She has dozens of stories about herself and others who have had their health problems solved naturally through similarly natural ingredients. In fact, one of the inspirations behind opening the shop was to pass her knowledge on to those who need it. Roswell Park patients and customers who come to the shop for health reasons like autoimmune diseases receive a 10% discount on all of Green Eats’ products. 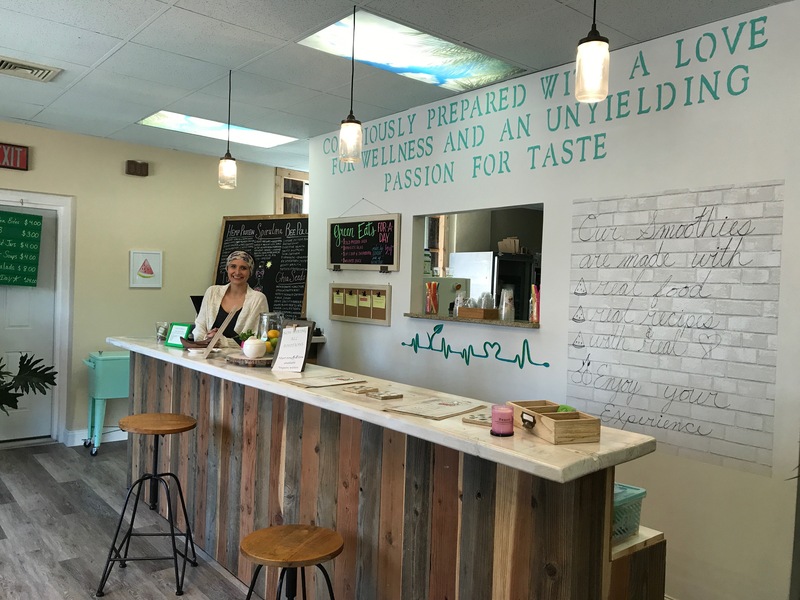 But specific health concern or not, the food at Green Eats from their smoothies to their power bites to their juice reboot and meal plans are sure to leave you feeling healthy, energized and refreshed.